Amid all of the ongoing disasters that Barack Obama has wrought on America one stands out as near treasonous – and we are not referring to Obama’s clearly unconstitutional open borders policy – but the spending, deficit and debt that has brought the world’s most productive economy to the brink of national bankruptcy. Yet, unless you read the fine print of the recent Treasury announcements you probably wouldn’t know that the United States had record tax revenues of $341,591,000,000 for the period between Oct. 1 and Nov. 25. The reason this was necessary, in the analysis of our friend Terence P. Jeffrey of CNSNews, was because the Treasury drew down its cash balance by $45.057 billion during the period, starting with $126,568,000,000 in cash and ending with $81,511,000,000. The only way the Treasury could handle the $942,103,000,000 in old debt that matured during the period, plus finance the new deficit spending the government engaged in, was to roll over the old debt into new debt and issue enough additional new debt to cover the new deficit spending. 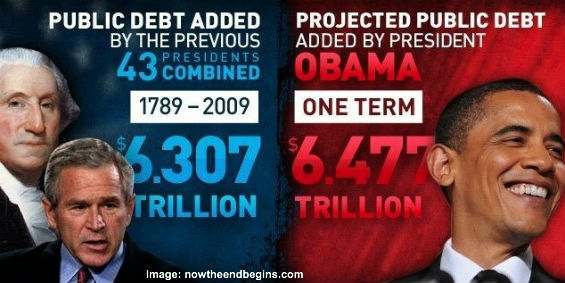 It also means that total US debt has increased by 70% under Obama, from $10.625 trillion on January 21, 2009 to $18.005 trillion most recently. And it means that total U.S. debt to nominal GDP as of Sept 30 (which was then $17.555 trillion) is now 103% of GDP. If you want to know why American corporations are holding some $2 trillion in cash – much of it overseas – look no further than that debt to GDP ratio and contemplate the confiscatory taxes that would have to be collected to balance the budget when $341,591,000,000 isn’t enough to cover the federal government’s spending and debt service. We think the point at which spending must be reined-in was reached and passed a long time ago. Much as they will try, Republicans in Congress cannot blame this state of affairs entirely on Obama and the Democrats – they have promised to be the Party of fiscal responsibility, but whenever they are put to the test on spending they buckle and keep right on spending. And make no mistake, at some point Congress has to balance the budget and the only ways to do so are to cut spending, raise taxes or do both. Such a tax burden would wreak havoc on the American economy and our country's quality of life for generations to come. This politically motivated spending – literally the attempt to buy our votes with our own tax dollars – is killing the country, and it must be stopped. Slowing the rate of the increase in spending isn’t enough anymore. Choosing to spend at this level – and it is a choice by Democrats and Republicans alike – amounts to a betrayal of our country and it is time we call it what it is; a treasonous level of spending, deficit and debt. *Hat tip to Terence P. Jeffrey of CNSNews for the calculations. Submitted by bcnavygw on Sat, 12/06/2014 - 15:12. Want a clue how effective the GOP will be in countering the reckless actions of Obama and the Democrats? Check out their continuing complicity in running up the National Debt! All other issues are dwarfed by this one issue, which, at some time in the near future, will destroy the economy and the dollar. When that happens, life as we know it is over, and yet our elected officials can't seem to help themselves from speeding us to destruction. Submitted by bcnavygw on Tue, 12/02/2014 - 14:49. This will NEVER stop until the Nation's economy lies in ruin and it finally affects the idiots who keep electing those who choose to ignore the reality of this tragedy . . . and probably not even then! Submitted by bcnavygw on Tue, 12/02/2014 - 14:34. We cannot, in good conscience, blame the politicians. We keep electing them!